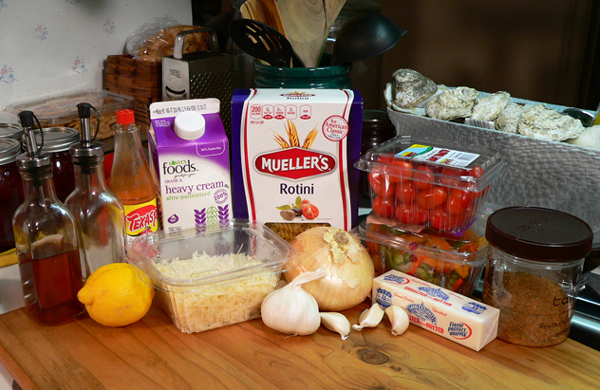 Follow step-by-step, photo illustrated instructions for making our Crab Annie pasta recipe. Careful, Annie comes packing heat, perhaps you’ve heard about her. Made with fresh Blue Crab meat, you could easily substitute imitation crab meat to save a little money if desired. Annie is pretty frugal anyway, she wouldn’t mind. This dish comes together quickly, is served warm, and the whole family will enjoy it. Printable recipe included. Jazz music may be credited with originating in New Orleans, but it’s certainly moved on up into North Carolina over the years. In my younger years, I enjoyed watching the likes of Louis Armstrong on TV, and I’m all ears when some ragtime piano starts to play. Scott Joplin anyone? Jazz takes on many forms, styles and interpretations, much more than we can even begin to get into here. Jazz festivals are held all across the country each year, from the New Orleans Jazz Festival, to North Carolina locals like the Apex Jazz and Music Festival, to the North Carolina Jazz Festival of Wilmington, just to name a few. Music festivals are always about the music, but you’ll certainly find some great food to go along with them. For 30 years, the New Orleans Jazz Festival, has served a pasta dish named “Crawfish Monica.” Created by chef Pierre Hilzam, he named the dish after his wife Monica. Folks line up at festival time for a Styrofoam bowl of the pasta and Crawfish, which has a creole type seasoning, and it has been voted as a favorite for many years. But, that’s down in Louisiana, what about here in North Carolina. I got to thinking about that, and figured we need a jazz tradition of our own. While I’ve tried Crawfish, sucking the innards from the heads of those “bugs” just doesn’t appeal to me much. I love the seafood standards, like fish, oysters and shrimp, but I like those fried. Our own pasta type dish would need something different, something more “feisty. 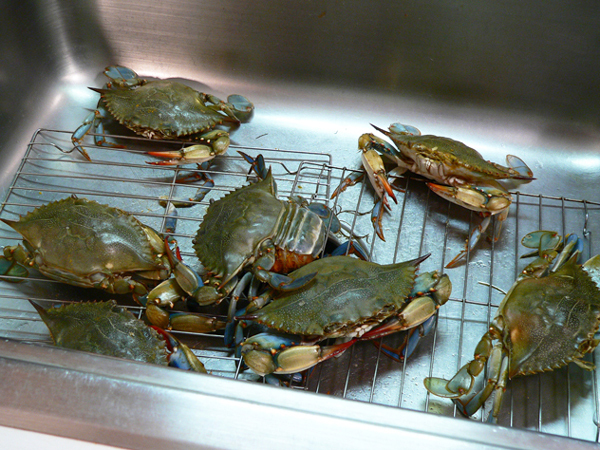 “How about Blue Crab?” They’re pretty feisty little creatures, in more ways than one. Blue Crab are charming, feisty, cute, interesting, entertaining, quick to defend themselves, and certainly much more appealing than something often referred to as bugs. Blue Crab it is I reasoned. 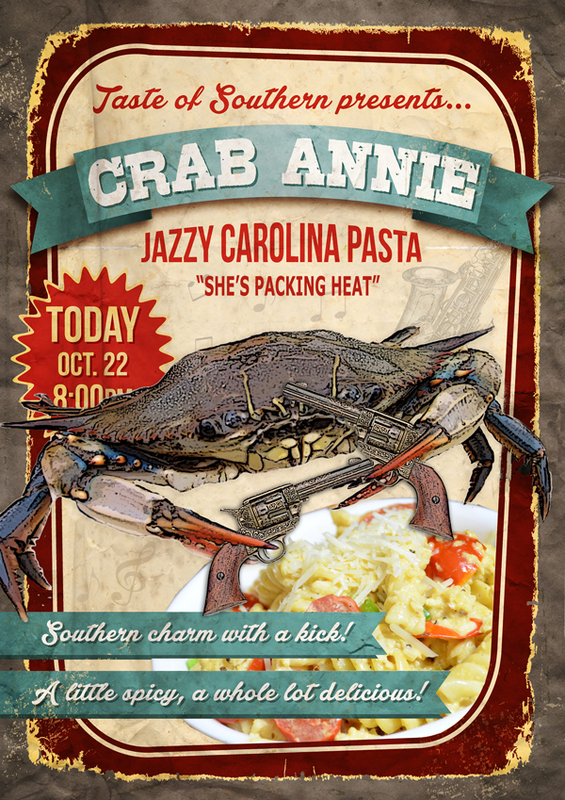 So, let me introduce you to Crab Annie, our very own Jazzy Carolina Pasta creation. I named the dish after my friend Annie. Annie admits she can be a bit feisty some times, and like our pasta dish, she’s “packing heat” now that she has a six-shooter of her own. She’s certainly interesting, cute and charming, and I find her sense of humor to be quite entertaining most of the time. 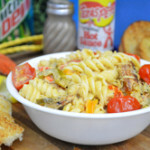 Crab Annie, our Jazzy Carolina Pasta Dish uses a very special blend of “secret” spices. You knew it would though, right? A guy has to keep a few secrets you know. 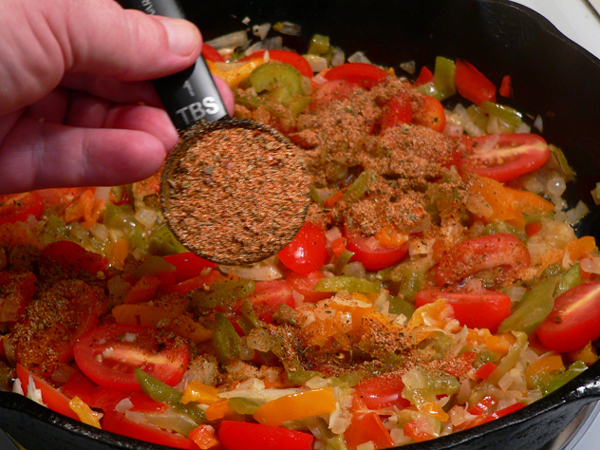 To get around that, I’ve included a “copycat” recipe of the seasoning blend, which you’ll need to make first. Our dish is best made with fresh Blue Crab which can be a bit expensive, and a bit more time consuming trying to pick out enough meat. Although it will serve about 8-10 people, feel free to use imitation crab meat, or even shrimp if you must. Either way, add it to your list of recipes to try this summer. I expect to see restaurants everywhere soon offering Crab Annie on their menus. It should also be available at all the North Carolina area Jazz Festivals, once it starts catching on. I just hope they’ll give me credit for creating it. It might help me score some points with Annie when the recipe becomes famous. I’ve already designed a poster for when that happens. Crab Annie is a little bit spicy what with all the peppers and the Texas Pete Hot Sauce. Still, this version is mild enough all the family should enjoy it. Adding more “heat” will be up to you and your personal tolerance for hot stuff. Just be sure to serve it up with Annie’s favorite soda… Mountain Dew. Ready to give it a try? Alright then, grab those claws and… Let’s Get Cooking! Keep an eye out for “Crab Annie.” I can see this popping up on restaurant menu’s everywhere real soon. 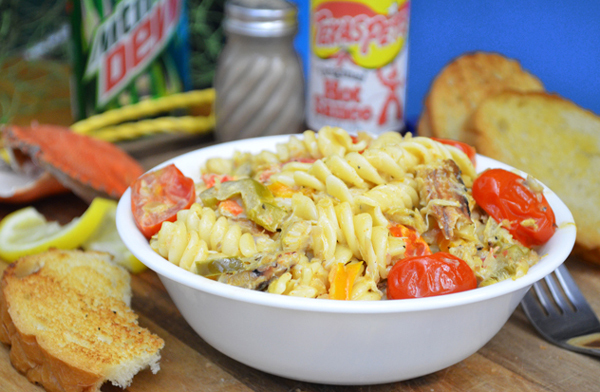 Crab Annie, Jazzy Carolina Pasta Recipe: You’ll need these ingredients… plus some crab meat. 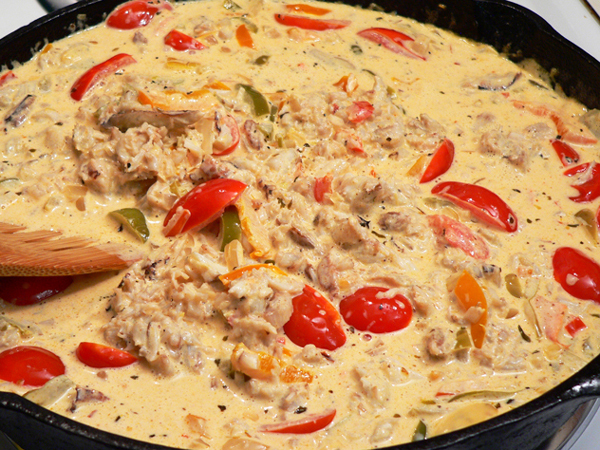 Crab Annie is best when you can use fresh Blue Crab meat. But, as mentioned, you could substitute with some imitation just as easily, and a good bit cheaper. My local seafood store had just started carrying some Blue Shell Crab when we prepared this recipe. The all female crabs were a bit on the small side, and you’d certainly need a few more than this to come up with a pound of fresh crab meat. Blue Crab are entertaining little creatures. Feisty as well. I probably just leaned on the sink and watched them for about 30 minutes once I brought them home. They’re very interesting. Unlike fish, they just seem to be looking straight at you at times. When I added some water to the sink, they all started “bubbling,” and appeared to be enjoying it. Did you know they shed their shells? They shed them in order to grow larger. Females only mate one time in their life, but males will mate numerous times. They can lay over one million eggs at a time. Amazing. And this is how they look after being cooked. Enough said. Let’s move on with the recipe. 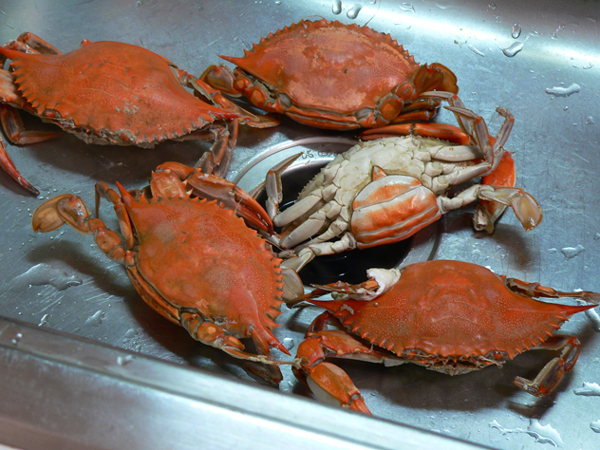 Crab Annie Seasoning: You’ll need to make up a batch of seasoning for this dish. The full list of the 12 spices you’ll need, is included in the printable recipe at the bottom of this post. Just measure them out carefully, place them in a jar and shake them up together. You’ll need three Tablespoons for this dish. You can also use it on fish, shrimp, or chicken. This version is fairly mild, but you could certainly heat it up by adding more Cayenne Pepper. 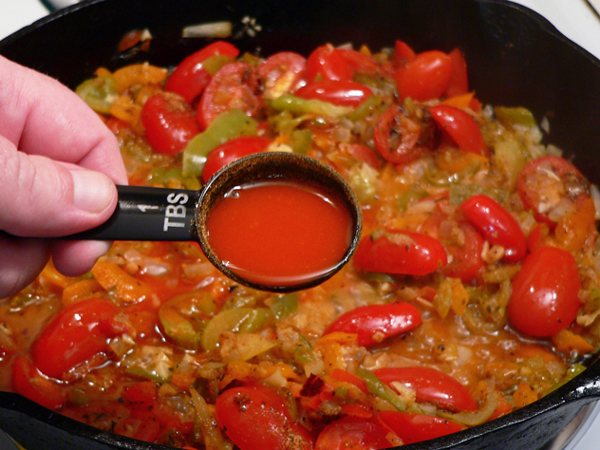 Start out with the basics, then increase the heat as desired if you want it hotter. Prepare the Pasta: Go ahead and get the pasta cooking. It’ll be ready by the time you get the vegetables ready. Prepare the pasta according to the package directions. Let it cook until al dente, which will take about 8-10 minutes. Prep the Vegetables: The dish comes together fairly quickly, so it’s best to go ahead an prep all of your vegetables before you start making the sauce. Dice the medium Onion. I found a package of sliced bell peppers on sale at my local grocery store. 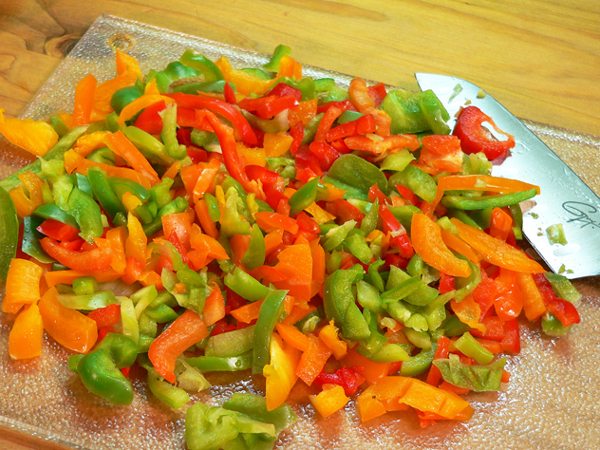 I’ve made this dish before using just green bell peppers, but I really like the looks of adding a variety of colored peppers. You could use, red, green, yellow, whatever is readily available. Dice them up into smaller pieces. 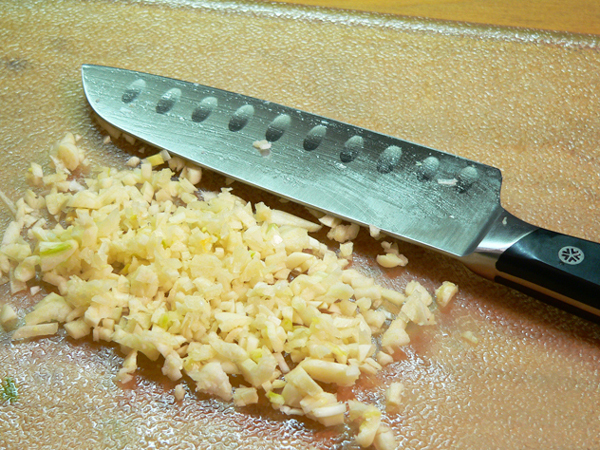 Chop the garlic, or mince it if you have one of those little gadgets for doing that with. I’m going to break down and buy one of those for myself one of these days. Halve about 20 little Grape Tomatoes. Set all the vegetables aside. When the pasta is cooked, it’s time to begin putting it all together. 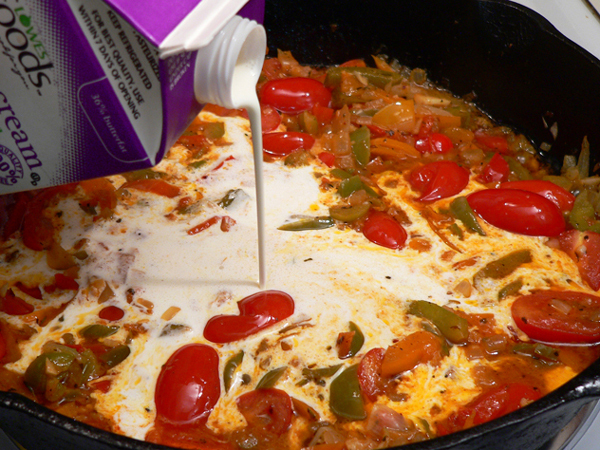 Remove one half cup of the cooking liquid and set it aside for the moment. 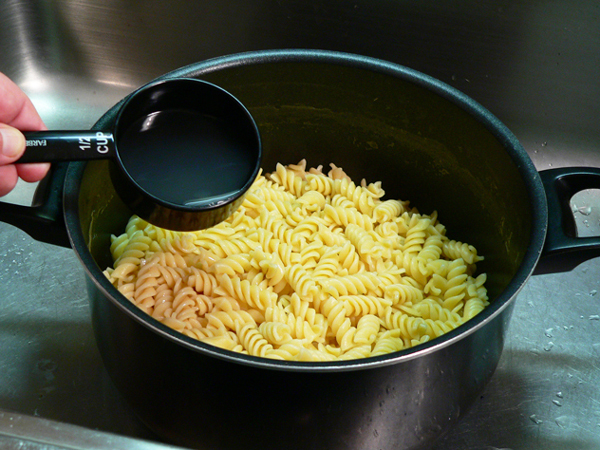 Now, drain the pasta in a colander. I didn’t rinse mine, as I want to keep it warm. 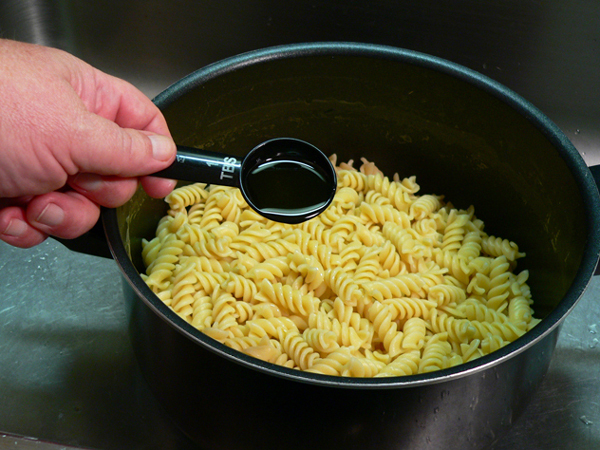 Place the drained pasta back in the same pot you cooked it in. 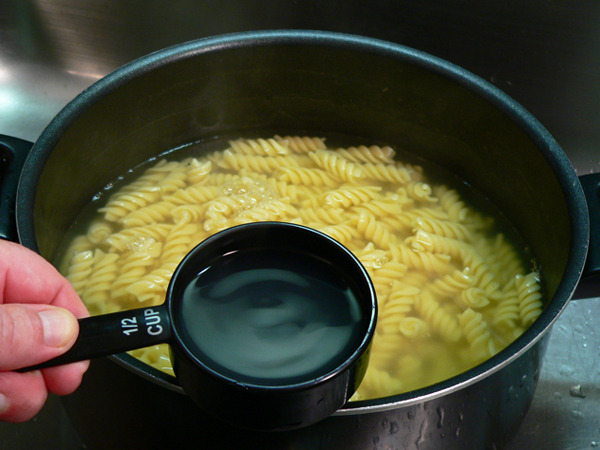 Add the half cup of reserved pasta water back to the pasta. 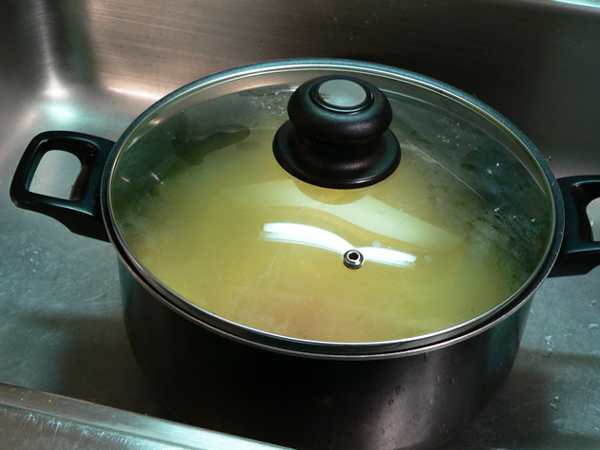 Place a lid on the pot to cover it, then set it aside somewhere to keep it warm. 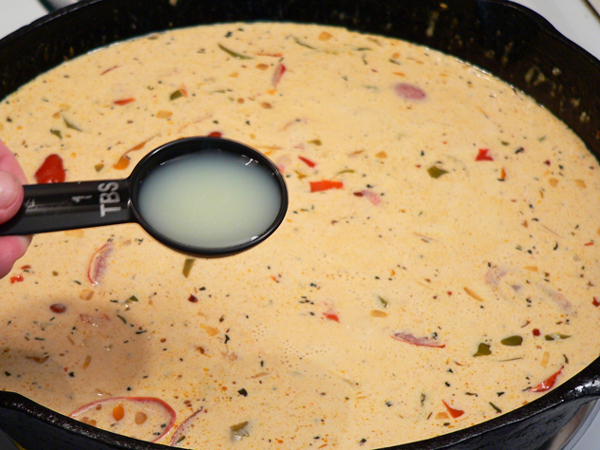 We’ll be adding the sauce to it in just a few minutes. I make the sauce in my cast iron skillet. 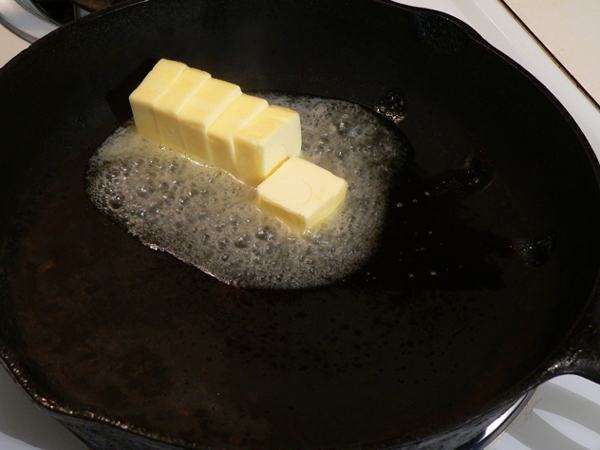 Place the skillet over medium heat, let it warm up a bit, then add the Butter. 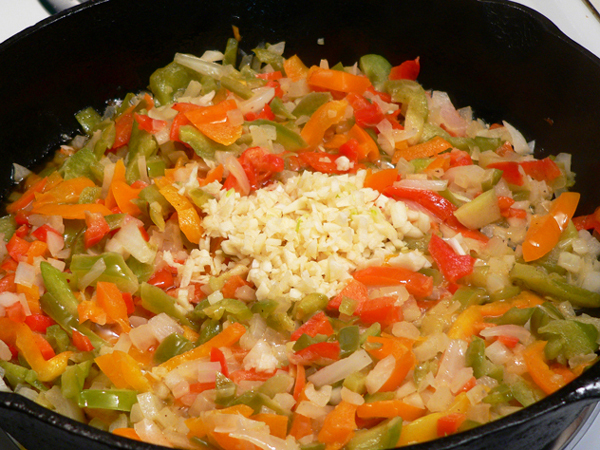 When the Butter has melted down, add the Onions and the Bell Peppers. 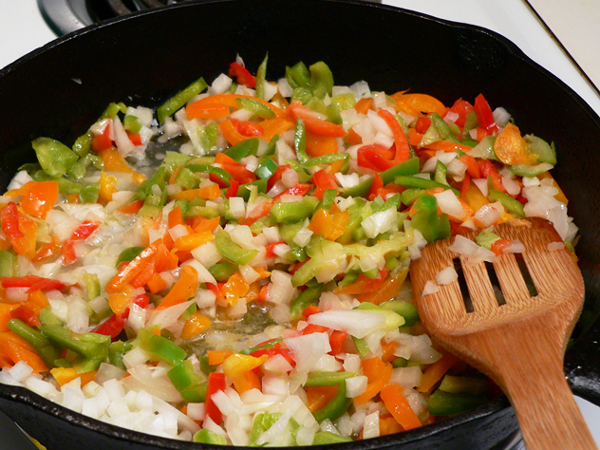 Stir the Peppers and Onions together, and let them cook for about 5 minutes, or until the onions start looking translucent. Don’t cook them too fast or let them start burning. Stir the Garlic. You really don’t want to let the Garlic burn. Keep a watch on it and let it cook for just about one to two minutes. 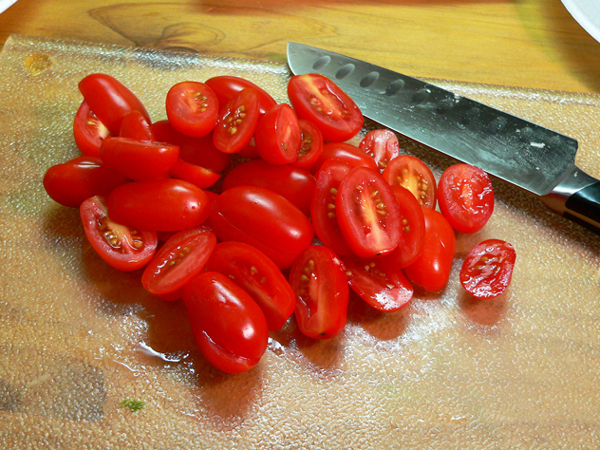 Add the halved Grape Tomatoes. Add the Crab Annie Seasoning mix. Sprinkle it all around the pan. 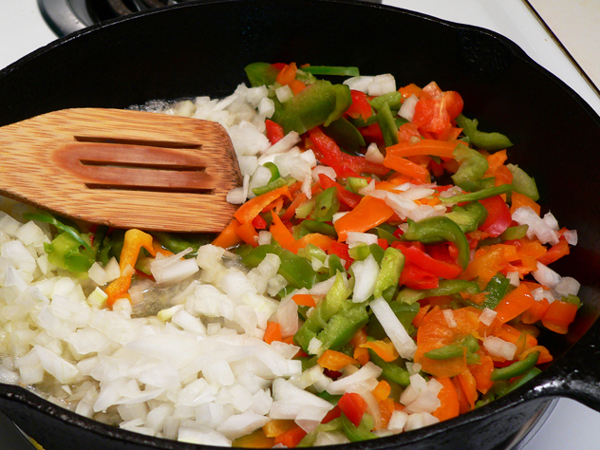 Stir the seasoning into the vegetables. Let this cook about one minute. Add the two Tablespoons of Vinegar mixed with two Tablespoons of Water mixture. Add the Texas Pete Hot Sauce. Stir the mixture again. Let it continue to simmer and reduce down a bit until it slightly thickens. Add the Blue Crab Meat. Gently stir everything together again. 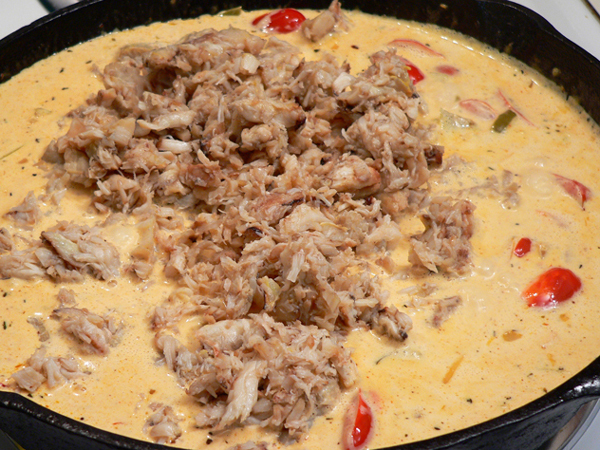 Since the Blue Crab meat is already cooked, we just want to let it simmer long enough to get the crab meat warm. When the Blue Crab meat is warmed, give it one last stir, then add it to the pot with the pasta. Add the half cup of grated Parmesan Cheese, then stir everything together. You need to serve the pasta while it’s still warm. 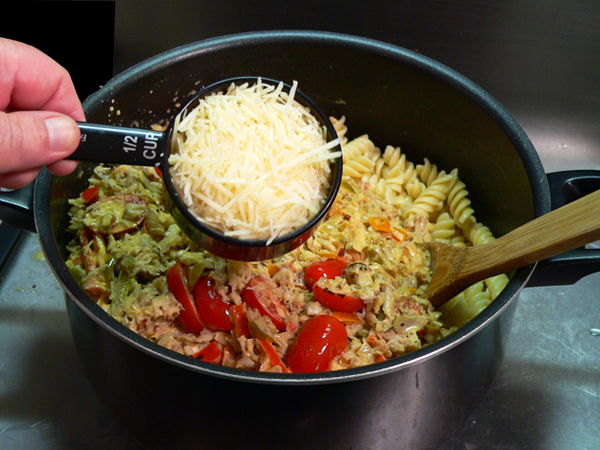 Follow step-by-step, photo illustrated instructions for making our Crab Annie pasta recipe. Careful, Annie comes packing heat, perhaps you’ve heard about her. Made with fresh Blue Crab meat, you could easily substitute imitation crab meat to save a little money if desired. Annie is pretty frugal anyway, she wouldn’t mind. 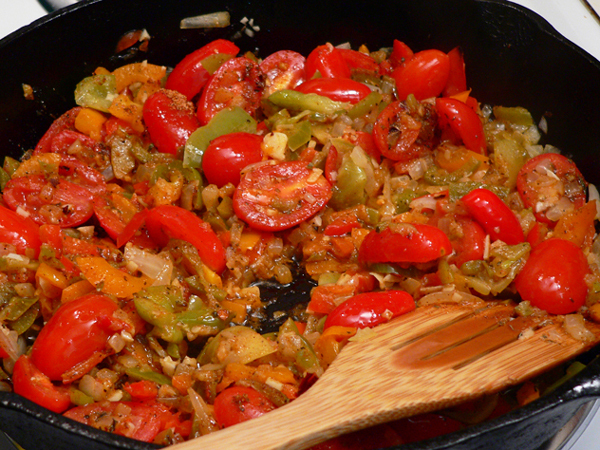 This dish comes together quickly, is served warm, and the whole family will enjoy it. 1 lb. 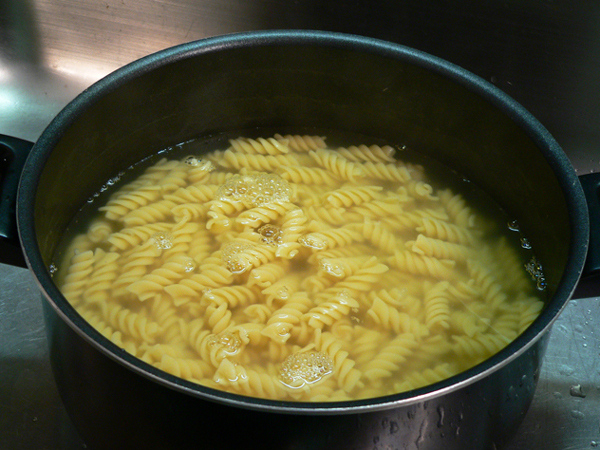 Rotini Pasta, cooked, and reserving ½ cup of cooking liquid. 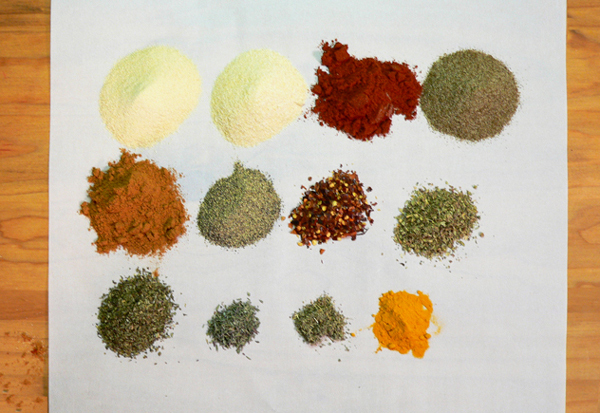 Place all spices in a small container, cap, shake well to fully mix. 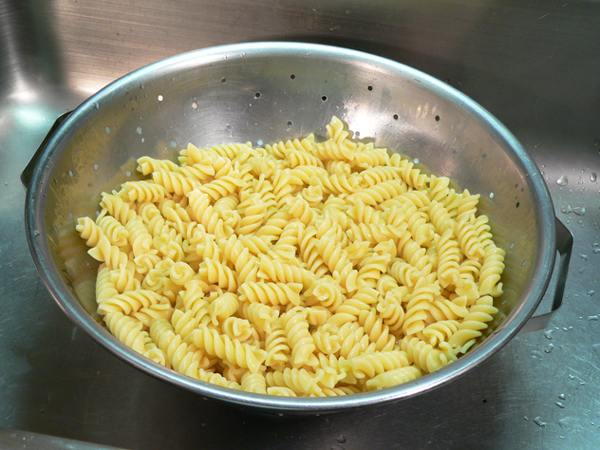 Cook pasta shells in a large pot of salted boiling water until al dente, about 8-10 minutes. 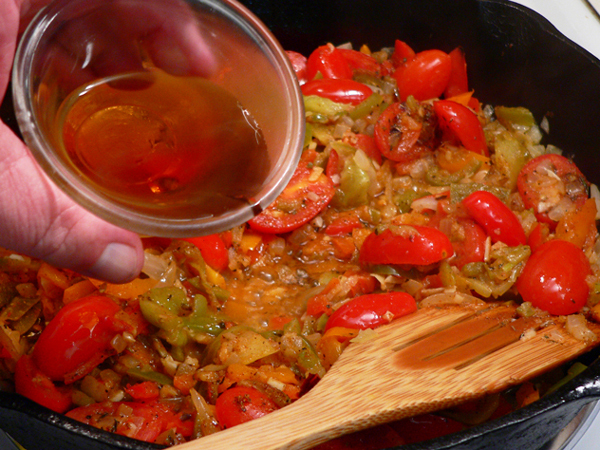 Remove ½ cup of the cooking liquid and set aside. 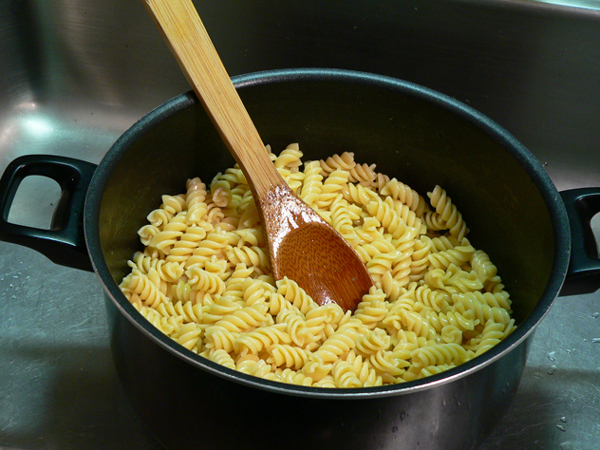 Return pasta to cooking pot. Add the reserved cooking liquid, toss well, and cover to keep warm. 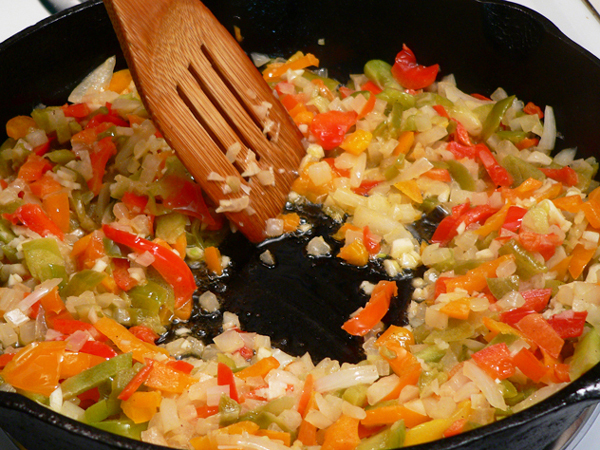 Add onion and bell peppers, cook, stirring until soft and tender. About 5 minutes. Add the garlic. Stir and let cook one minute. Do not allow to burn. 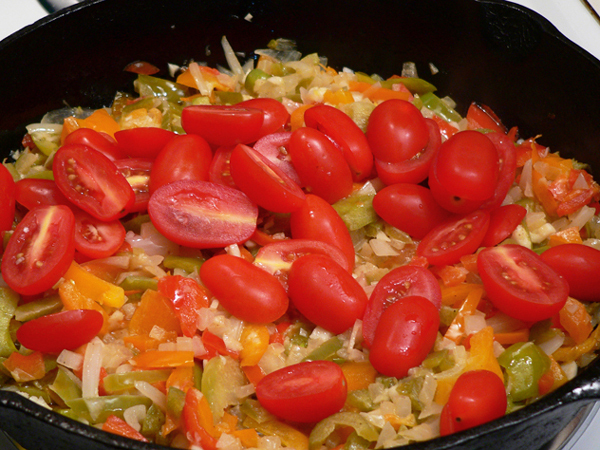 Add the halved grape tomatoes, stir and cook for 1 minute. Add Crab Annie Seasoning Blend, stir and cook for 1 minute. 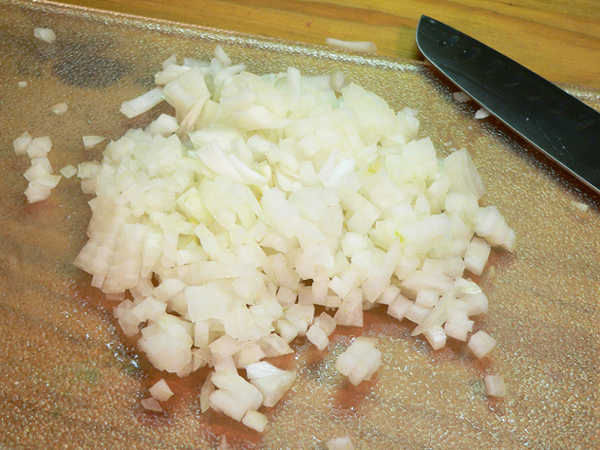 Add the two Tablespoons of vinegar mixed with 2 Tablespoons of water. 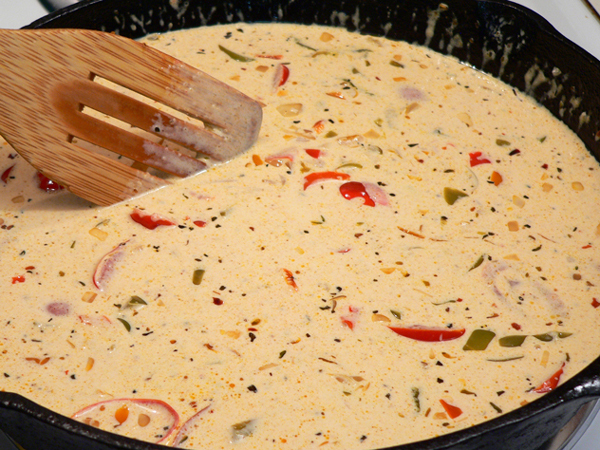 Continue to stir and cook until liquid has slightly reduced and thickened. Add crab meat, continue to stir and let meat warm through. Add the sauce mixture to the cooked pasta. Add ½ cup of the grated Parmesan cheese. Stir lightly to combine. Taste, and add salt if needed. Place in serving bowls and top with remaining Parmesan cheese. Make this with Imitation Crab Meat if desired. Your Comments: Are you going to try our Crab Annie recipe? I’d love to hear your comments about it. It will only take a minute or two for you to share your thoughts with us in the Comments section below. Please note that all of our Comments are moderated. That just means that I personally read each and every one of them before they are approved for our family friendly site here on the Internet. Your comment will not appear immediately, but I’ll do my best to get it posted online as soon as possible. I also try to reply to as many of your comments as I can, so be sure to check back later for that. I do appreciate you taking the time to share your comments with us, and I’ll look forward to hearing from you. Thank you in advance. Can I just say thank you? I was having a terrible Monday morning and your newsletter just made me smile. By the end I was actually in a good mood. I hope your friend Annie has a wonderful birthday. Looks wonderful. Wondering how spicy since 3 types of pepper? Thanks enjoy your posts! Glad to hear all is well with you. Thanks for your, as always, interesting newsletter. Great recipe could substitute all kinds of seafood or landlubber fare thanks Steve God Bless You & Yours! Sounds wonderful. Living here in the north (Michigan) I will probably use lump crab. Having a flat on an interstste is a scary, dangerous event. Glad all worked out well! This recipe looks fabulous but since I don’t care for seafood of any kind, I will not be making this but will pass it along to my sisters who love all seafood. I just wanted to tell you though that I love the name, the story behind it snd I really love the poster! Thanks for all you do. Your stories always make me smile and your recipes are wonderful! Sounds really good! Not sure if we can find crabs around here….maybe use shrimp. Thanks for sharing.